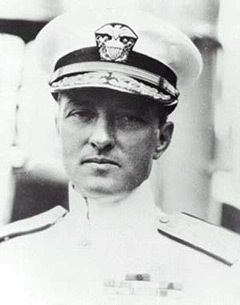 Rear Admiral Richard Evelyn Byrd, Jr., USN was a naval officer who specialized in feats of exploration. He was a pioneering American aviator, polar explorer, and organizer of polar logistics. Aircraft flights, in which he served as a navigator and expedition leader, crossed the Atlantic Ocean, a segment of the Arctic Ocean, and a segment of the Antarctic Plateau. Byrd claimed that his expeditions had been the first to reach the North Pole and the South Pole by air. His South Pole claim is generally supported by a consensus of those who have examined the evidence. Byrd was a recipient of the Medal of Honor, the highest honor for heroism given by the United States.